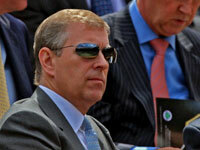 The Duke of York has reportedly struck a uniformed policeman while driving into Buckingham Palace. Police are investigating the incident in which the officer was apparently trying to move two Japanese tourists out of the way of the Prince's 4x4. The policeman suffered minor injuries to his arm and has made a complaint to his superiors, hellomagazine.com reports. A Metropolitan police spokesman confirmed the accident was being investigated. "A uniformed officer was involved in a collision with a vehicle whilst on duty on Constitution Hill and sustained minor injuries to his arm," he said. A Buckingham Palace spokeswoman responding by simply declaring: "This is a health and safety matter," InTheNews.co.uk reports. The prince, 49, has not been arrested or questioned but CCTV film is being studied. The accident happened before the prince flew to Central America last week in his role as British trade ambassador. Last July he angered staff at Windsor Castle by racing through the Great Park in his Aston Martin, This is London informs.